A website dedicated to a unique pool of unfiltered, wide-ranging, non-partisan, independent and highly topical content on a daily basis that can be drawn upon to extrapolate a comprehensive and in many cases startlingly vivid picture of what is taking place. We advocate the freedom of humans for evolutionary self-determination, through liberating oppressed knowledge and disclosing hidden secrets purposely and unlawfully concealed or simply forgotten over time. The Edge explores all aspects of holistic living — the experience of living authentically, the integrative approaches of complementary healing, eating consciously, the arts, metaphysics and the intuitive arts, our integral connection with nature, spirituality and the mysteries beyond. Explore the articles and blogs which is updated regularly. Located in the Midwest in USA. Articles can also be submitted to the magazine through the website. The site is updated daily. Many interesting postings, videos and vlogs. Keep up to date on whats happening. Combined for the first time in one updated and revised volume, the three books of The Mind Chronicles Trilogy--Eye of the Centaur, Heart of the Christos, and Signet of Atlantis--show that all the places, times, and beings we have ever known exist now in our memory banks. Using the mind state produced during 100 sessions of hypnotic regression, Barbara Hand Clow unlocks the primordial memory bank--the records of time in which all humans participate--offering readers critical information to reflect upon now. In The Mind Chronicles, Clow guides readers through 100,000 years of human history, using in-depth experiences of initiations and sacred ceremonies to illuminate the forgotten wisdom of our ancestors. She shows that this ancient knowledge, which is contained deep within all of us, is becoming even more relevant as the Mayan Calendar comes to a close and a new stage of evolution begins. Originally printed in the JULY-AUGUST 2008 issue of Quest magazine. Citation: Kliegman, Isabel Radow. "Tarot and the Tree of Life." Quest 96.4 (JULY-AUGUST 2008):137-141. WELCOME TO THE GREAT ADVENTURE! Together we are about to embark on an exploration of a time-honored facilitator of psychic growth and the Tarot cards. Many facets of the Tarot's origins, history, and evolution remain enmeshed in controversy and mystery. Tarot refers to a deck of seventy-eight pictured cards which most people associate with Gypsy fortune tellers. Others, for various reasons, have traced their origins back to the Egyptians. A more scholarly approach would say that Tarot first appeared in thirteenth-century France, in the still-available Marseilles deck. At that time, they were produced on leather and metal, predating both the invention of paper and the arrival from India of the Gypsies. The seventy-eight cards are of two basically different kinds: the Major Arcana (Arcana, as in our word arcane meaning "secret," "esoteric," or "hidden away"), of which there are twenty-two; and the Minor Arcana, of which there are fifty-six. So we have the "great secrets," the Major Arcana, and the "small secrets," the Minor Arcana. The Tarot eventually became associated with the Holy Kabbalah, and in particular, the Kabbalistic Tree of Life. There is the predictable controversy about when and how these two giants of metaphysical thought came together, with theories ranging from biblical times to the nineteenth century. However, it is clear that by the nineteenth century, the two modalities were used in concert, to the great enhancement of the Tarot cards. In 1856, Alphonse Louis Constant, known as Eliphas Levi, published the first book to associate the twenty-two cards of the Major Arcana with the twenty-two letters of the Hebrew alphabet and the four suits of the Minor Arcana with the Tetragrammatonâ€”the four-letter name of God. In 1889, Gerard Encausse, a student of Levi known as Papus, published The Tarot of the Bohemians, which asserts that the Tarot was generated by the Tetragrammaton and is to be understood in terms of it. Another student of Levi, Paul Christian, created a system combining Tarot with Kabbalistic astrology. Also in 1889, Oswald Wirth published a deck of Major Arcana whose twenty-two designs incorporated the twenty-two Hebrew letters. Both his teacher, Stanislos De Guaito, and Papus were members of the Kabbalistic Order of the Rose Cross, which has come into modern times as the Rosicrucians. The connection between Kabbalah and Tarot continued to be recognized in the execution of decks by such proponents as Aleister Crowley, Paul Foster Case, and Manley Palmer Hall. Although the Hebrew letters do not appear in his deck, Arthur Edward Waite, a member of the Hermetic Order of the Golden Dawn, assigned Hebrew letters to the cards in his writings. 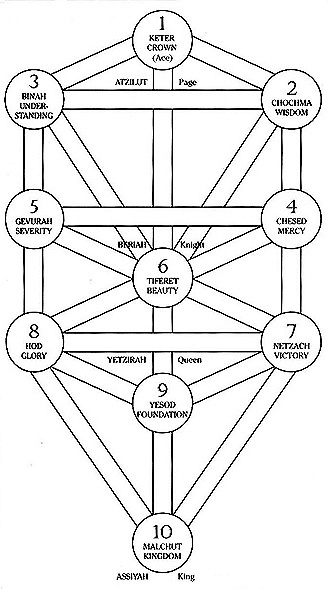 The Golden Dawn deck, executed by Robert Wang, associates the ten sefirot, or vessels, with the ten numbered cards, and the four olams, or realms, with the suits of the Minor Arcana. Aleister Crowley, in the Book of Thoth, went so far as to assert that "the Tarot was designed as a practical instrument for Qabalistic calculations." Regardless of the actual origins of Tarot and Kabbalah, by 1890 Kabbalistic teaching was integral to Tarot design. It is my contention that the expanded understanding and use of Tarot has Kabbalahâ€”properly understoodâ€”at its root. The Minor Arcana fall into four suits: Pentacles, Cups, Swords and Wands. Pentacles became Diamonds (the word pentacle refers to a coin within which is a five-pointed star, or pentagram), Cups became Hearts, Swords became Spades, and Wands became Clubs. Of course, our deck of playing cards has fifty-two cards, and the Minor Arcana of the Tarot, as I have mentioned, number fifty-six. The disparity can be explained in that we have three royalty cards in our modern deckâ€”the jack, queen, and king. But the Tarot equivalent is composed of four court cardsâ€”the page, knight, queen and king. The page and the knight collapsed into one another to make the jack. If we look at the aces of the Tarot, we see in every case a similar image. We see the hand of God, a huge, oversized hand coming out of the sky, out of the heavens through a cloud, shining in a halo of white light. Doing what? Offering a gift. Kabbalah means "receiving." The aces are doing the giving, and the universe is doing the receiving. They give us the gift of pentacles, of cups, of swords, and of wands. Each of the suits corresponds to what the ancients called elementals and also to what the great psychologist Carl Jung called the functions of consciousness. The Suit of Pentacles refers to earth, the Suit of Cups refers to water, the Suit of Swords refers to air, and the Suit of Wands refers to fire. Having announced that authoritatively, I must add that you can find reputable writers who disagree with almost every one of these associations: C. C. Zain pairs Pentacles with air and Swords with earth, and Stephan Hoeller relates Swords to fire, for example. The Suit of Pentacles has to do with how we relate to money, how we relate to our career, to our state of health, to the material world. If I get sick, how do I feel about that? What do I do about it? When I go to work, is it just a way for me to earn money, or is there a sense of service involved? Not the world, but how we interact with the world, is the domain of Pentacles. The Suit of Cups has to do with our feelings: how we feel, how we express feelings, and how we respond to the feelings of others. The Suit of Swords has to do with our clarity, our ability to analyze, our capacity to think clearly. It also has to do with our courage. The Suit of Wands reflects the fiery energy that on one end of the spectrum expresses as frank physical sexuality and on the other end of the same spectrum as intuition, psychic knowing, and inspiration. Of more interest, in Jungian terms, the Suit of Pentacles refers to the sensate function, information that comes to us through our five senses. The Suit of Cups refers to the feeling function, our emotional response to stimuli. The Suit of Swords refers to the thinking function, how we consciously process information. The Suit of Wands refers to the intuitive function, that mysterious way of somehow knowing, and to what Freud called libido, our primitive life force. Each of these is equally valuable. The four court cards have similar associations: pages with earth and the sensate; knights with air and the mental; queens with water and the feeling-toned; and kings with fire and the intuitive. It is my belief that everything that is part of human experience can be expressed by, and is expressed in, the Tarot. What a card conveys is determined by a complex of factors. So how do you know? How do you know when you're reading the cards what interpretation to put on them? Ah, that's what makes the game so interesting. That's why, over the centuries and our personal lifetimes, the Tarot is never in danger of boring us. It demands our intuition as well as our knowledge. It requires feeling, perception, and an awareness of all the other cards in a spread as a distinctive pattern. It also exacts a sense about the person for whom one is reading. Sometimes things we intuit seem to be coming not from the cards but through them. When that happens, the process is amazing and wonderful. A Tarot reading shows you where you are headed if you continue your present course of action. It is the flashing light of warning. The cards are only little cardboard pictures, to be protected or destroyed by you. They have no power other than the power you invest in them. They are the instrument. The power is in you. The power is in each of us, in the glorious human psyche, with its infinite capacity to search and sense and stretch and unfold. Kabbalistically speaking, we want to identify with the sap that moves all through the Tree of Life. The universe is in constant motion. Nothing in the universe is static. The chairs on which we sit are composed of molecules racing through the space between them. The blood circulates in the body. The air flows in and out of the lungs. If we lock our knees and say, "Now I've got the Truth! This is where I want to be and this is where I'm going to stay!" something will happen (instantly, in my experience) that forces us to make a readjustment. If we can avoid rigid attachment to a single perspective, a single way of being, a single truth, we are more likely, as our universe continues to change, to be ready for whatever happens next and to answer the demands of the experience. We are now ready to turn our attention to the Tree of Life, an instrument of great power that will prove invaluable to our understanding of the cards. Each vessel, or sefirah, on the Tree is named for an attribute of the infinite, unknowable God. Each bears an archetype of that manifestation of the divine. The Minor Arcana may be seen as pictorial expressions of those archetypes. Underlying the historical association of vessel and card is a potent, mysterious psychological truth: The Kabbalistic Tree of Life provides the archetypes by which the Tarot can be understood. This observation is well made by Stephan Hoeller, drawing on the teachings of Carl Jung, in The Royal Road: "The coincidence of the two systems . . . is not a mere haphazard concurrence of unrelated circumstances, but is a meaningful coincidence of great psychological, or if you prefer, mystical power and purpose." As Gershom Scholem conceded privately to Stephan Hoeller, and as the latter emphasizes in The Royal Road, "the combined system of Kabbalah and Tarot works. . . . Past history matters less than firsthand experience." If the proof of the pudding is, indeed, in the eating, then sample the wares herein and be your own best judge. If we are going to enter the mystical realm of Kabbalah, which draws so heavily on the female side of usâ€”the intuitive, the psychic, the mysteriousâ€”we have to approach it with a highly developed male part of ourselves. To use Jungian terms, if we are going into anima activity we need a strongly developed animus. If we do not have this, whether we are male or female, we are going to be yanked way off balance. Each of us, male or female in body, is androgynous. To study Kabbalah, we require a strongly developed male side, so that logic, reason, objectivity, and the capacity for analytical thinking will balance the experiences we may encounter in this pursuit. Mystical experience, regardless of its source, must, if it is to have meaning, occur inappropriate context. Maturity, balance, and the wish to use these experiences to enhance rather than to escape from life are wise criteria to apply here. The most important thing to know about Kabbalah is very simple: Kabbalah means "receiving." We are dealing with an explanation of the creation in terms of a generous God. (Kabbalistically, the godhead is twofold. There is Adonai, the male aspect of the godhead, the Lord. And there is the Holy Shechinah, the female aspect of the godhead. We are dealing with an androgynous spirit, not to be understood as male but as the divine ruling spirit, the Eternal One. Basic to the Kabbalistic system, then, is that the universe is created by a loving God whose wish is to give and who has created us specifically as creatures who can receive, with loving awareness and conscious appreciation. We have choices to make, and we can fall into evil ways, but we are born perfect. There is a blueprint for all human beings, for all experiences, and for any system that one can imagine. This universal symbol, central to Kabbalah, is the Tree of Life. When we look at the Tree of Life, it certainly is a strange-looking tree. Clearly then, this is not meant to be a representational tree. The Tree is conceptual. What is of extreme importance about a tree is that it is a single organism. We can't look at the beautiful crown of the tree with its brilliant green shining leaves and its bright pink-and-white blossoms and say, "Well, that part of the tree I like. But these filthy roots down in the dirt? I don't see what we need those for!" We have the roots, the trunk, the bark, the branches; we have the twigs, the leaves, and the blossoms: what we see here is diversity in oneness. That's the message of the conceptual tree. Isn't that what the universe is, the uni being the oneness and the verse the diversity? So it is true that we are all one and that the universe is a single organism. It also true that there is great diversity. This is certainly true of ourselves as well. What we are is a single wholeness, and we cannot separate out the parts of ourselves that we think are unworthy or that we don't like or that we think are bad or evil. Our challenge is acceptance, recognizing that everything we have is a part of one whole and that everything we have enables us to function. Perhaps the aspects of ourselves we like least will turn out to be as valuable to us as the roots are to the tree. Another cardinal message of Kabbalah, then, is integration. We are not here to get rid of anything. If it didn't belong here, God wouldn't have put it here. We are here to integrate everything we have and everything we are in order to put it to its best possible use. We are challenged to think a new wayâ€”as an energy that has the potential for positive thrust. The challenge, as always, is toward oneness. We are challenged to be at one with God, at one with one another, and at one within ourselves. Perhaps this last is our most difficult endeavor. We see that the Tree has three pillars. The right-hand pillar is called the Pillar of Mercy. It is the pillar of energy flow, and it is called male or masculine and positive. The left-hand pillar is called the Pillar of Severity. It is the pillar of form. It is called female or feminine and negative. (Here we must interpret "negative" in terms of a necessary "nothing" in the same way that a socket is a nothing, an emptiness which receives a plug.) A connection is required to make the energy flow. We need both the energy and the form. If you want a drink of water, and the water is the energy flow, it must be in something; you need something to give water form, for example, a cup. To give form is to restrict, and yet without form we can receive nothing at all. The central pillar is the Pillar of Harmony. It is the pillar of integration. Our task is to acknowledge the darknessâ€”in the world, in ourselvesâ€”and integrate it with the light. The Pillar of Harmony is the place where these energies come into perfect balance. We have to work the Tree in the way that is called the Way of the Serpent, which winds all around the Tree and slowly, gradually, and patiently experiences and integrates every energy on the Tree. Continuing our examination of the Tree of Life, we direct our attention to the series of circles that make up these pillars. These are called sefirot, the singular of which is sefirah. A sefirah is a vessel, created to contain the divine energy that emanates from the godhead. The Tree may be perceived as a many-tiered fountain. As God allows energy to flow forth, the energy is caught up in the first sefirah. When that overflows, it fills the next two sefirot, and when they overflow, they fill the following two sefirot, down into the sixth sefirah, and so on. As we turn our attention to the Tarot, we can only be amazed at the ways in which these two totally distinct and disparate systems of thought converge, leading us to a single great teaching. In exploring the relationships between the Tarot and the Kabbalistic Tree of Life, we discover parallels that make remembering the cards, as well as understanding them, simple. We are struck by the fact that there are ten sefirot on the Tree of Life and ten pip, or numbered cards, in each suit of the Tarot. This numerical association alone invites us to connect the ace through ten of each suit with the sefirah corresponding to its number. Keter, as the first sefirah on the Tree, corresponds to the aces, for example, while the fifth sefirah, Gevurah, lays claim to the fives, Hod to the eights, and so on. We will find as we explore these connections card by card that the associations do not seem to be those of chance. Rather, there seems to be an intentionality, a rightness, even a clear fit in some cases between the sefirah and card that share the same number. This synchronicity, in Jungian terms, benefits the student of Tarot in a number of ways. First, it separates the forty pip cards from the sixteen court cards, making each more conceptually manageable. Instead of being accosted by fifty-six random images to memorize, we begin with forty that break neatly into four groups of ten. Ten cards numbered one through ten, each of which seems to have a sefirah governing it, is a reader-friendly proposition compared to fifty-six disorganized images clamoring for our attention. In assigning the pip cards to the sefirot of the Tree of Life, we introduce a further suggestion that facilitates both understanding and remembering the cards. The implication is that similarly numbered cards of each suit have something in common. And, indeed, what they share is their association with one of the ten sefirot and the distinctive character of that sefirah. If we have understood what the energy of Chesed is, for example, in assigning the fours of each suit to that sefirah, we can say, "Look at the image of the Four of Cups. How does what I know about Chesed (mercy) color my perception of that card? Can I detect the quality of that vessel in the Four of Wands? How does it help me to understand the Four of Swords? How does the nature of Chesed challenge my initial impression of the Four of Pentacles?" The appropriateness of the match between sefirah and Minor Arcanum is more powerful in some cases than in others, or at least more obvious. The coincidence of sefirot and pips challenges us to seek meaning and connection, to grasp why the image of the Four of Cups and that of the Four of Wands belong to Chesed, to find what, in essence, they share. Even at its most arcane, the connection between the sefirah and the cards that belong to it by virtue of their numbers is worth pursuing and exploring. The sixteen court cards also break into four clear groups: kings, queens, knights, and pages. Once again, we are confronted with a numerical correspondence in the Tree of Life, this time with the four olams or worlds. Understanding the nature of each world will inform our understanding of each set of court cards. Again, seeing what the pages of each suit have in common, how they are manifestations of the olam that they all share, enables us to remember them more easily. The process is reciprocal. The nebulous flavor of the sefirah or olam is rendered intelligible when we see, in the image of a Minor Arcanum, a palpable expression of it. Conversely, we find deeper meaning in the cards as we come to understand how they are characterized by the sefirot and olams of the Tree of Life to which they are assigned. That there should be twenty-two Major Arcana in the Tarot and twenty-two paths connecting the sefirot of the Tree of Life is the final mysterious connection between the two symbologies. Papus believed that from the Tarot alone all wisdom and knowledge could be elicited. If he was right, then there is no way to exhaust the riches it will yield to each of us. Isabel Radow Kliegman, a graduate of Cornell University, attended Oxford as a Fulbright Scholar, and earned her Masters degree at Columbia University. For over twenty-five years, Kliegman has devoted herself to consulting, lecturing, teaching, and conducting workshops on the Tarot and related subjects. A published poet, she spoke at International Tarot Congress, and received an award from the United Sensitives of America. Kliegman resides in Pacific Palisades, CA. This article is an excerpt from her first book, Tarot and the Tree of Life (Quest 1997); her companion piece, tying the Major Arcana of the Tarot to the paths on The Tree of Life, is in progress. We are promoting receiving the newsletter via the Internet email in form of an attached PDF file. We are proposing this for a few reasons to assist in cutting cost, reducing cutter in your home and above all convenience. Our Rays of Truth Newsletter is always available here on our web site as a PDF file via link above. If you are new to our website please feel free to ask for newsletter. We do not share any contact information with anyone. Thank you for your response in our endeavor. then if you wish to be removed from the USPS (Post Office - hard copy) please include this notification in you email.